REQUEST FOR QUOTATIONS | WEST GRAINS INC.
West Grains’ warehouse is situated in Pulilan, Bulacan, a brand-new warehouse that has a 5,000-metric ton capacity storage for Rice Bran, Copra Cake Meal, Corn Meal, Wheat Pollard, Soybean Meal — unpolluted, flood-safe, pest-proof and quality controlled. In the global scene, the Philippines is the best location in Asia to do international agriculture trading because of it’s strategic geographical location and climate suitable for business and trade all year round. West Grains maximizes the abundance of land in Bulacan, one of the provinces in the region called the Rice Granary of the Philippines. We have the capacity to deliver 1000 metric tons of assorted raw materials for feeds per week — Rice Bran, Copra Meal, Corn Meal, Wheat Pollard, Soybean Meal. 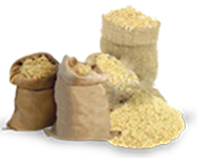 West Grains gives premium to the freshness of raw materials that come from the country’s abundant fields such as Rice Bran, Copra Meal, Corn Meal, Wheat Pollard, and Soybean Meal. Our quality inspectors are trained to identify the slightest signs of poor product quality. West Grains aims to bridge the gap between country-side farmers and farm product-processing plants by providing farmers room for sustainable growth. West Grains aims to expand from being a trusted raw mats provider for local feeds company – Rice Bran, Copra Meal, Corn Meal, Wheat Pollard, Soybean Meal) to becoming a dependable exporter of agricultural products, primarily coconut products including coconut oil, coconot sugar, dessicated coconut, coconut cream and milk. West Grains - The leading exporter and trader of quality grains and agricultural products in the Philippines, Asia and Europe.